Goood morning sweet coffee, tea and cocoa loving fiends… I mean friends! 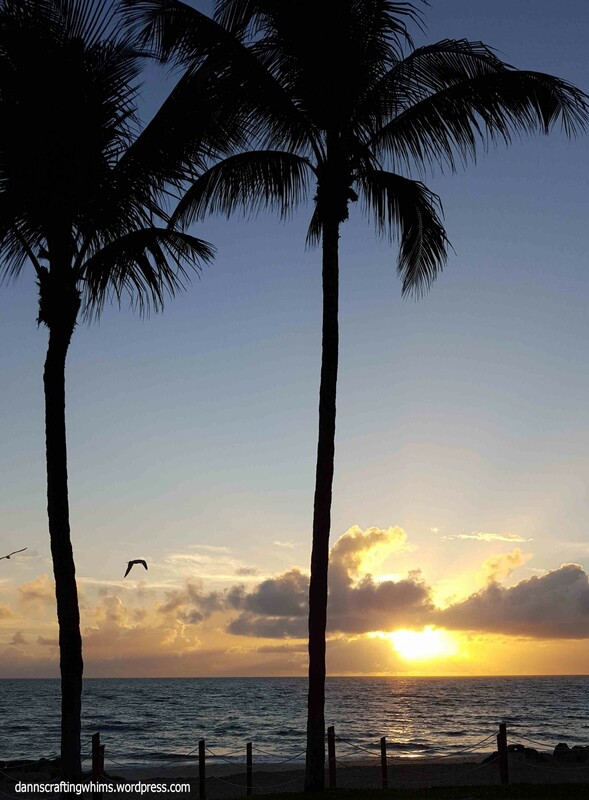 : ) Since some of you are experiencing nasty winter weather, I thought I’d send you a bit of balmy Florida 74 degree sunshine to warm you up and brighten your morning. Now you know why I still consider a Frappuccino a winter card! 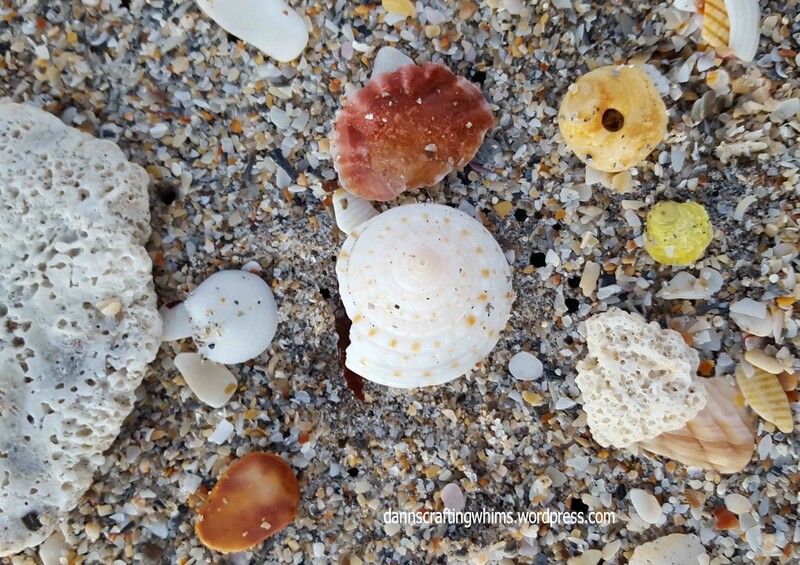 At our southeast Florida beach, you will mostly find small white and cream colored shells… tellins, arks, clams, broken cockles, and occasionally coral bits and cat’s paws. Not the plethora you find over at Sanibel, but just a few hither, thither and yon. Today, instead of drinking my green tea Frappuccino (In case you’re wondering why it’s brown, it’s made with raspberry syrup, YUM!) while comfortably sitting in my car with the windows down and enjoying the sunrise, like usual, I actually got my feet in the sand now that it’s cooled down enough to walk on it without scorching them. I just went down to the went down to the tide line for a couple of minutes to take this picture of the card on some coral rocks with the ocean and sunrise in the background and I happened to look down and found my first sundial ever in decades (not saying how many!) of beach combing! What a pleasant surprise!! Ahhh…. a green tea frap, a glorious sunrise and a rare shell… Yep, sometimes it’s truly small things in life that can make your day a whole lot better!! The sundial is in the left corner, closest to the purple and beside the amazing neon yellow little shell. What gorgeous creations! In case you were wondering, the acronyms are for: Clean And Simple (CAS)and CASE, which means Copy And Share Everything, including credit for the person whose card you copied. I knew it was going to be a frappy day when I finished coloring my card and pulled off the new-to-me 3M Micropore tape that was a gift to me for DIY washi tape. I thought I’d use it to mask the inking and get some inked tape to boot. 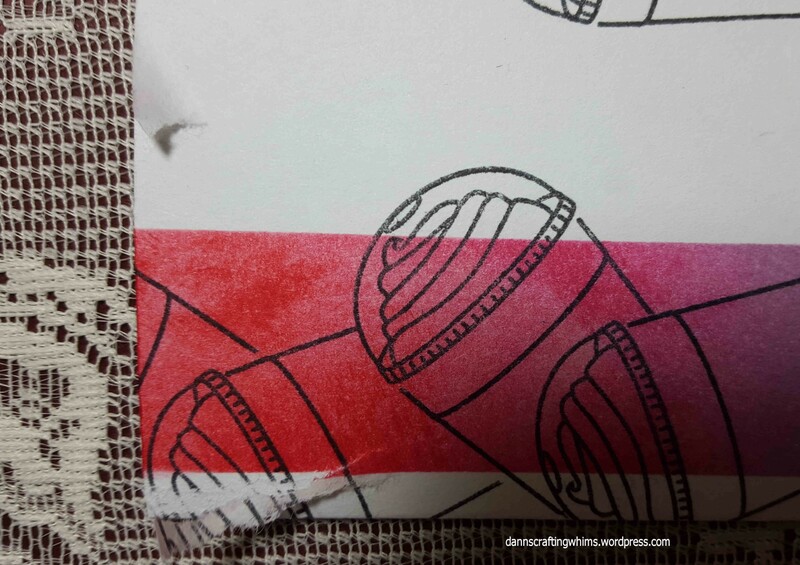 It didn’t take the distress ink too well and it ripped the top layer of the cardstock. YIKES! Fortunately there are fixes for minor disasters such as this, like covering it up with just a pinch of lace! I daresay that at a first glance you didn’t notice the tear, although now if you go back and enlarge it, you can still see it’s still there, but at least anchored at the top under the lace. I’m sure my friend who often brings me my favorite frap for a treat won’t mind the little imperfection. Life goes on. Wishing you a warm (at least in your cup!) and sunny day! This entry was posted in Any Occasion Cards, Cards, Friendship Cards, Papercraft, Sympathy/Support cards and tagged 3M Micorpore Tape, Beach, Coffee Loving Cardmakers, Distress Ink, Frappuccino, Lil' Inker Designs Coffee Talk, lilinkerdesigns, rangerink, sssmchallenge, Sundial, Sunrise, timholtz distress inks, Tombow adhesive, Winter 2015 Coffee Lovers Hop by dannscraftingwhims. Bookmark the permalink. Love the border you created! Such a cute card! Love your card, D.Ann, but I love the photos of the beach more…longing to live where you are! Alas, this was my last move, so I will enjoy your beach from afar! Have a wonderful day, keep those lovely creations coming! Your card is lovely, as always! But those beach photos gave me a mini mind vacation. Here in the Northeast we’re having unseasonably warm weather as well, but we sure don’t have those views! Gorgeous……..EVERYTHING!!! I envy your beaches….so beautiful. Although I have seen the sunset over the Pacific, I’ve never seen a sunrise over an ocean! What a lovely way to begin your day!! How very exciting to find the sundial shell. Thanks so much for sharing your beautiful photos with us along with your wonderful cards. I love the colorful sunrise colors you used. And that little torn area is not at all noticeable with all the other loveliness nearby! Great pictures and wonderful card! Super cute card. I love Starbucks green tea Frapp!!!! You are amazing!! I Heart your blog!! Love this fun card! My favorite coffee drink is the Starbucks Peppermint Mocha Frappe! Thank you for sharing your awesome pictures…it was 39 degrees last time I looked so I’m sure it’s dropped a bit. 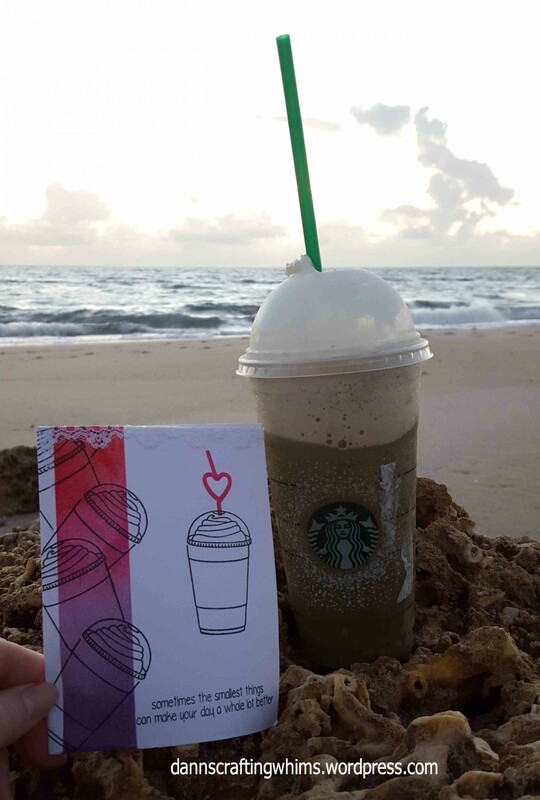 Love your frap card, it’s awesome. CAS card and elegant, and like the lace you added on the top of the card. very pretty. Beautiful card and awesome photos! You live in a beautiful spot! Love how you staged your photo of this adorable card! I love that cup! Super cute and love the view. Looks so warm and nice. Thanks for joining us at Markerpop! Looks like a pretty day, and a lucky one, at the beach. Even though we’re in Wisconsin, it’s been in the 50s and 60s here. Looks like we’ll have a green Christmas! Thanks for sharing your photos; so nice to see “winter” somewhere warm! 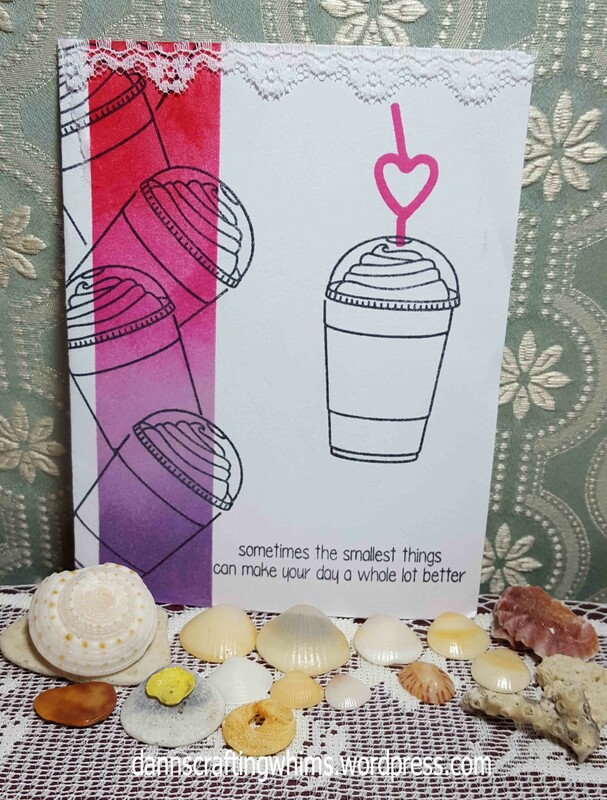 Sweet frap card in bright and sunrise-y colors. Love that smidge of lace! Very pretty. D. Ann, you just brought me back to my childhood. I was born Pompano, but we lived on the Pompano/Deerfield line, so we would go to Deerfield Beach all the time (I went to kindergarten in Deerfield, too). But your 1st photo w/the card … I can still remember that beach (and it’s been many decades for me!). Your card is lovely. Don’t you just love Angeline and her quick videos?! Sweet card. Love the stripe of color along the side. Thanks for sharing your sunshine with us! 🙂 Thanks for playing along with us at Simon Says Stamp Monday Challenge! Great design!! Love those cups!